When you want to determine rare coin values, there are many factors you must take into consideration. If you have been collecting coins for any length of time, chances are you have come across a coin or two that made you stop and wonder if you were in possession of a rare and valuable coin. If you are a novice coin collector chances are at some time in the future you will have that experience. As a numismatist, it is important to know how to determine whether or not a coin is rare and, if it is, knowing which resources to use to determine the coin's value. 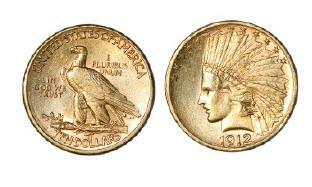 There are several factors are used to determine if a coin is considered rare. Each coin is rated for its rarity based on the coin's date and mintmark. To determine the rarity of a coin, the total number of coins in the original mintage and the estimated number of coins from that mintage that have survived through the years are taken into consideration. In other words, a coin's rarity is based on the number of that specific coin that are still in existence. Some coins are considered "condition rarities." This means the specific type of coin is commonly found at lower grades but is considered to be a very rare when it is a higher grade. Other types of rare coins include circulation strikes and proofs. US Coin Value Advisor tracks the trends of the United States coin marketplace. The website also includes coin value tables providing coin collectors and investors with information regarding a coin's historic value trends and a bullish US Rare Coins section of coins which have shown a significant growth in their value. Rare Coin Investments provides photographs and detailed information on United States coins including years minted, total number of coins put into circulation and the number of proofs minted. A valuable resource for identifying coins from all over the world, Don's World Coin Gallery, features more than 26,000 photos of worldwide coins. The value of a coin depends greatly on its scarcity or rarity. Generally, the rarer the coin the higher the value. The value of rare coins, just as other coins, antiques and collectibles, depends greatly on the law of supply and demand. The value is greatly affected by the number of collectors that want the coin and the number of coins that are available. The quality of a rare coin refers to the aesthetic beauty of the piece. There are certain coins that are in higher demand because their designs are considered by collectors to be more desirable than others. Two coins can be graded the same, but one may have a higher visual appeal than the other. The value of some gold, silver and platinum coins is based on their bullion value. The Official Red Book: A Guide Book of United States Coins by R.S. Yeoman is an excellent reference guide for coin collectors. The coin values in "The Red Book" are dealer values, or the amount of money a dealer would generally pay for the coins. These values are usually between fifty to eighty percent of the coin's retail value. Heritage Auction Galleries is a popular auction house for numismatic dealers and collectors. Knowing how to determine rare coin values is an important skill for all coin collectors.